The launch leveled much of the building and caused a fire to ignite, with shrapnel from the attack causing damage in the surrounding vicinity. 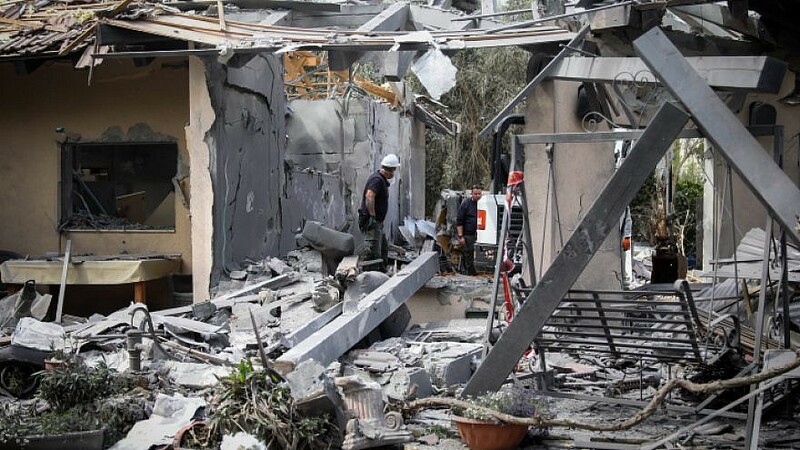 Israeli security forces inspect a house in Moshav Mishmeret, in central Israel, hit by a rocket fired from the Gaza Strip on March 25, 2019. Photo by Noam Revkin Fenton/Flash90. (March 25, 2019 / JNS) Seven people, including two babies, were injured in the upscale agricultural town of Mishmeret by a long-range missile fired from Gaza early on Monday morning. Victims include a 59-year-old woman and a 30-year-old woman with moderate injuries from shrapnel and trauma from the blast, in addition to a 30-year-old-man, 12-year-old girl, 3-year-old boy and 18-month-old baby who suffered light injuries. They were evacuated to Kfar Saba’s Meir Medical Center for care. Additional people were treated for shock and injuries associated with scrambling for shelter. Four family dogs in the building and in the vicinity were killed. The launch leveled much of the residential building and caused a fire to ignite, with shrapnel from the attack causing major damage in the surrounding vicinity. Air-raid sirens wailed throughout the Sharon and Emek Hefer regions north of Tel Aviv, but the Iron Dome air-defense system did not activate. Officials are investigating the failure. Monday’s rocket is believed to have been fired from southern Gaza, approximately 60 miles from Mishmeret, the longest-range attack from Gaza since the 2014 Gaza war, when rockets from Gaza hit Haifa, north of Tel Aviv. The weapon is believed to be a locally made J-80 rocket, though that has not yet been officially confirmed. No terror organizations have taken responsibility for the attack, but reports indicate that terror leaders have evacuated to protected locations in anticipation of Israeli reprisals. The Israel Defense Forces did not immediately respond to the attack. Israeli Prime Minister Benjamin Netanyahu will cut short his visit to the United States, during which he is expected to attend a ceremony where U.S. President Donald Trump will officially recognize Israel’s sovereignty over the strategic and historic Golan Heights. Israel closed the Kerem Shalom and Erez crossings, and the prime minister held a telephone meeting with IDF Chief of Staff Lt. Gen. Aviv Kochavi, head of the Shin Bet Nadav Argaman, National Security Council Director Meir Ben-Shabbat and additional senior security officials. It also urged hundreds of thousands of attackers to converge on the Gaza border with Israel to commence additional rioting, attacks on soldiers and efforts to break through to Israel in what the terror organization has dubbed the “March of Return,” which it initiated in a year ago this month.